No brush required. Dip the tops of pine cones in a dab of craft paint on a paper plate. Use white paint for a snowy look or bright colors for a fun, festive display. Cloves are the flower buds from the clove tree, which is indigenous to some islands in the Indian Ocean. The spice trade brought cloves to Western Europe in the 17th century. From August to January, certain stores belch cinnamon-scented mushroom clouds into the atmosphere. While too much of a good thing can cause a headache, the addition of a light, holiday-inspired scent can be a finishing touch to your décor. In Victorian times, pomanders provided this light scent. 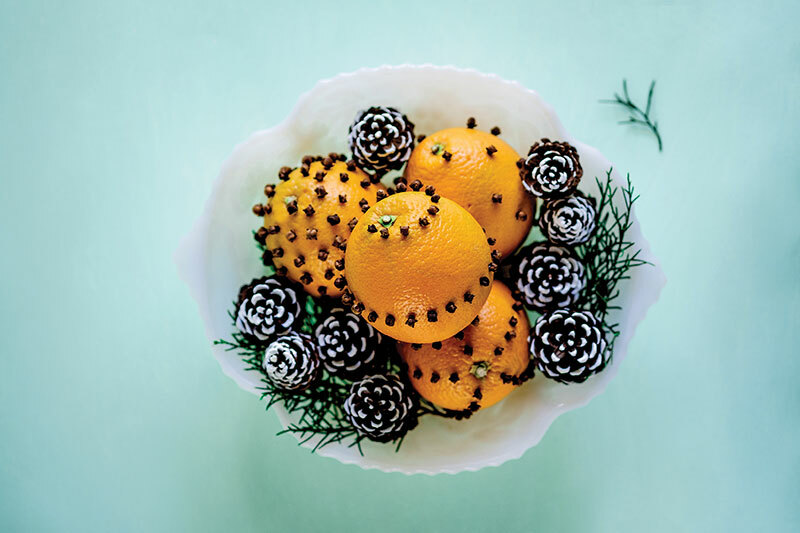 To make a pomander, stud a small, Satsuma orange with whole cloves. The cloves provide a lovely smell and also preserve the oranges. If you find it difficult to pierce the skin of your orange with the cloves, poke tiny holes in the fruit with a nail or skewer. Once you’ve finished decorating your oranges with cloves, place them in individual brown paper bags in a cool, dark place for a couple of weeks. This will dry them out. Check on them a few times a week and discard any that are moldy. When they are dry, arrange them in a bowl with cinnamon sticks or cinnamon-scented pinecones (don’t overdo it!) and fresh pine boughs.